This is a mid century modern Danish teak bar by Norwegian designer Torgbjorn Afdal. The bar is a corner cabinet with revolving bookcase and hidden bar, which can be locked. The original key is included. Once revolved, it reveals storage for liquor, glass and stemware. It has a mirrored back, circa 1960s. His pieces were collected by several world leaders, including First Lady Jackie Kennedy. Dimensions: 44.5″W x 26″D x 30.5″H. Accessories featured sold separately. 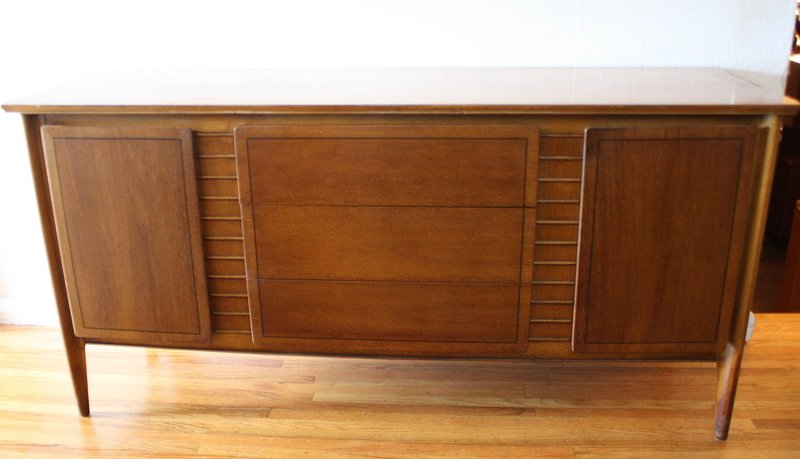 This is a mid century modern serving bar cart credenza, with an Italian travertine insert in the top. It has a solid wood frame with side shelving, a middle cabinet with brass pulls, and inside storage and drawer. The sides have a pretty rattan accent and it is on wheels for easy transport. Dimensions: 44″W x 18″D x 29″H. Accessories sold separately. 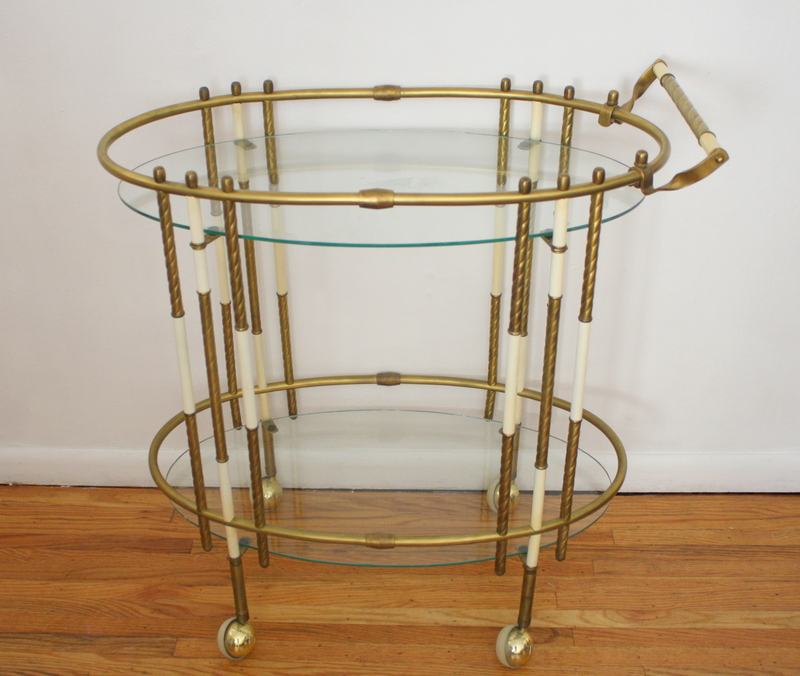 This is a 2 tiered mid century modern rolling bar serving cart. It has a bottom stainless steel shelf and bar accents. Dimensions: 45.5″W x 19.5″D x 29″H. Accessories sold separately. This is a mid century modern 2 tiered rolling metal bar serving cart in a cheerful sunflower. It can be folded into a compact size for storage. Dimensions: 25″W x 18″D x 31″H. 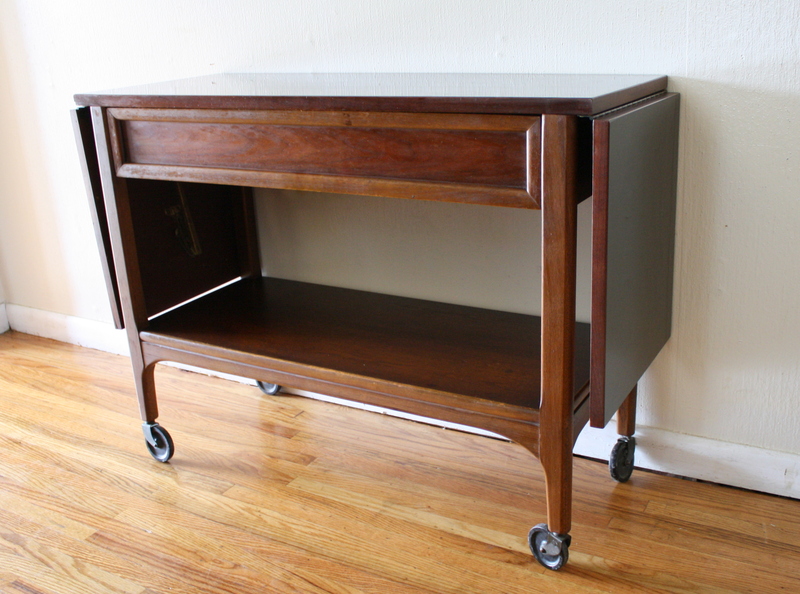 This is a mid century modern rolling bar serving cart with a hidden center section. The 2 leaves slide open to reveal the center, and give extra serving space. The bottom cabinet has 2 rattan doors with brass pulls, 2 adjustable shelves, and a serving drawer. Dimensions: leaves closed: 36.5″W x 18″D x 29.5″H, leaves extended: 57.5″W, center area only: 20.5″W, 16″D, each individual leaf: 18″W. This is a mid century modern 2 tiered rolling metal bar serving cart. It can be folded into a compact size for storage, and has a great mod design in black and white with atomic starburst accents. Dimensions: 28″W x 20″D x 33″H. This is a mid century modern teak bar cabinet. It has a fold out bar shelf, inside mirrored cabinet with glass shelf. There are also 6 storage drawers with Danish pulls. Dimensions: 23.5″W x 16″D x 51.5″H. Accessories sold separately. 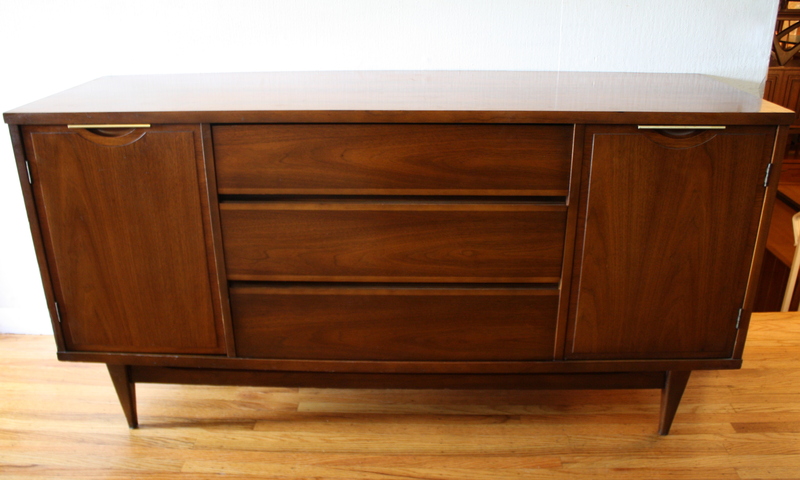 This is a mid century modern server mini credenza from the Kent Coffey Perspecta collection. It has their 2 flip top extension leaves, and their signature arches on a 2 door bottom cabinet. Dimensions: 39″W (closed) 62″W (both leaves open) x 18.5″D x 29″H. 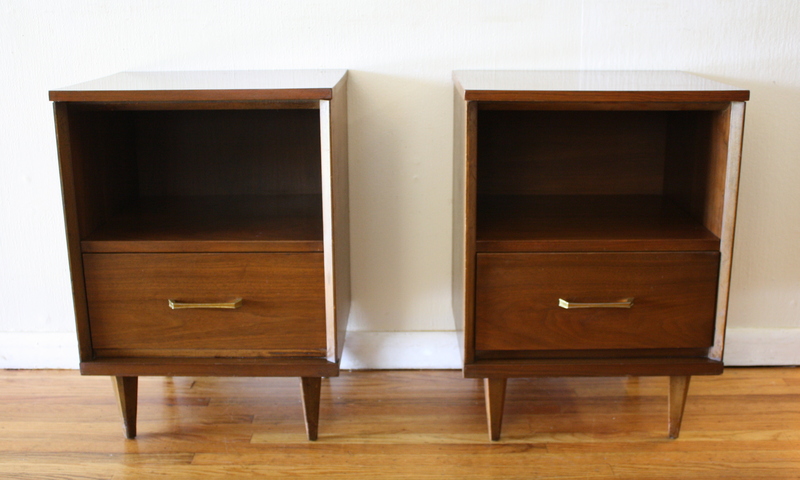 These are 2 different styles of mid century modern low dresser credenzas by Bassett. The first has 9 dovetailed drawers with a streamlined design: 60″W x 18″D x 30″H. The second 9 drawer dresser has curved brass handles: 60″W x 18″D x 30″H. 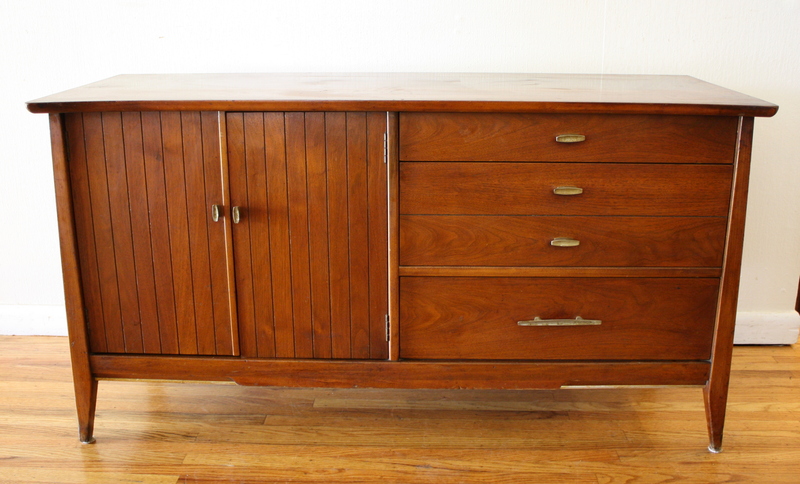 These are 2 mid century modern credenzas with side cabinets. 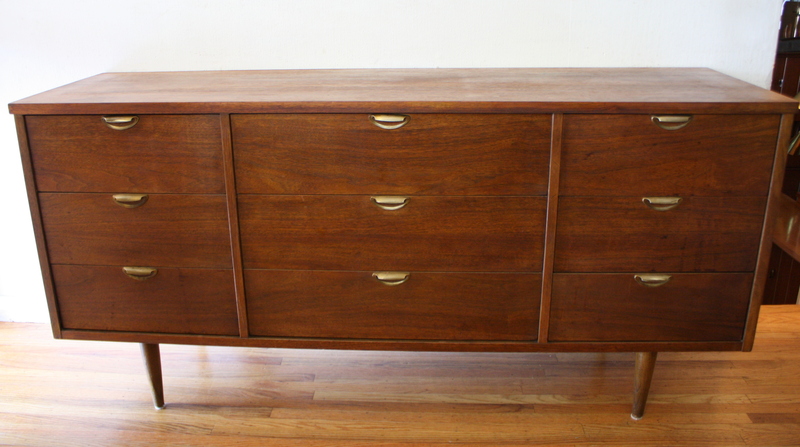 The first mid century modern credenza has 3 dovetail drawers with a streamlined drawer design, and 2 side cabinets brass handles and shelves: 59″W x 18.5″D s 30″H. 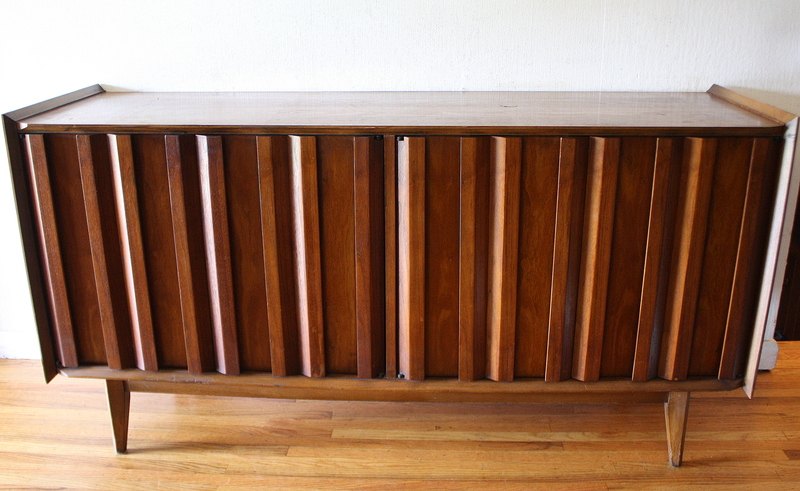 The second mid century modern credenza has a slatted design, 3 dovetail drawers with a streamlined drawer design, and 2 side cabinets with shelves: 62″W x 19″D x 30″H. These are 2 mid century modern china cabinet hutches. The first hutch cabinet has glass doors, the top has a tapered slanted design, and the bottom cabinet has a shelf with 2 side cabinet doors with sculpted drawer pulls. The cabinet can also be used as a bookshelf without the glass doors. Dimensions: 50″ W, 11.5″D (top), 17″D (bottom), 30.5″H (from floor to countertop of bottom cabinet), 64″ H overall. The second bar cabinet hutch has 2 cabinets that are height adjustable on their metal legs that run along its sides. The top cabinet has glass doors (also removable), the bottom cabinet has wood doors with sculpted handles. Dimensions: 36″W x 18″D x 65.5″H overall. 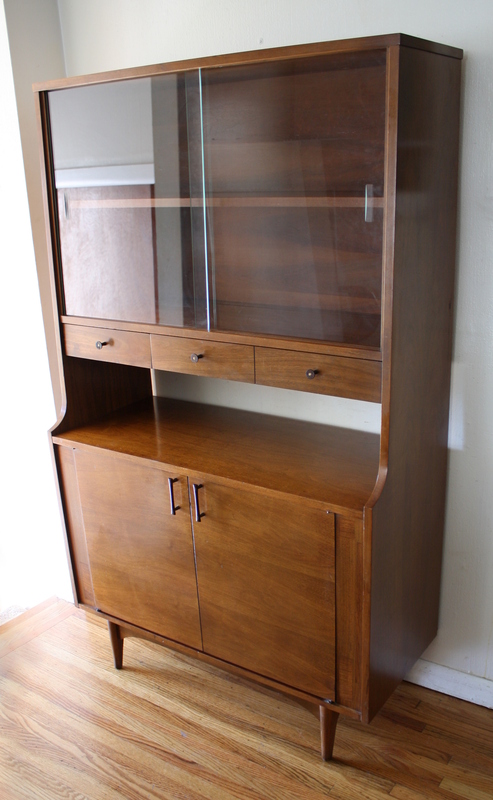 This is a mid century modern mini china bar cabinet hutch by Kroehler. It has a top cabinet with glass doors, an adjustable shelf, and 2 dovetailed drawers with rosewood knobs. The bottom cabinet has 1 solid wood doors with rosewood handles: 38″W x 16″D x 64″H. A perfect size for compact spaces, with beautiful curves and ample storage space. This is a vintage Hollywood Regency bar serving cart. 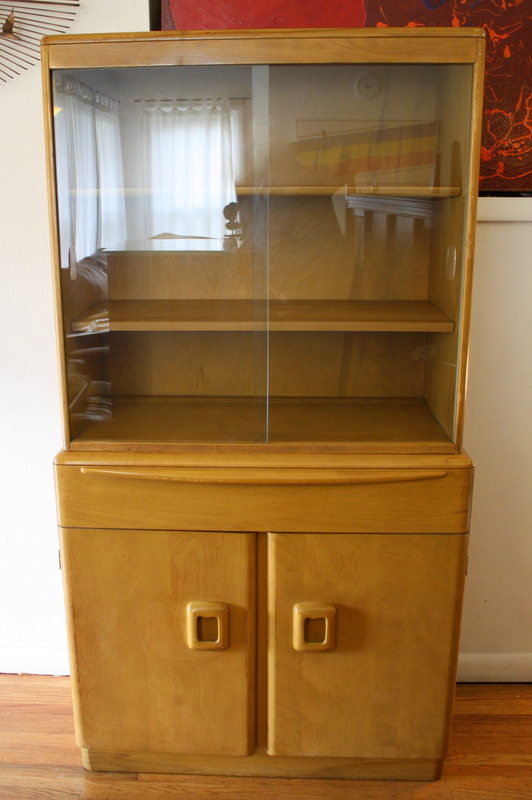 It has 2 tiers with glass shelves, rolls on wheels and has that fantastic HR gilded design. Dimensions: 31″W x 17″D x 33″H. This is a mid century modern hutch bar cabinet by Heywood Wakefield in a champagne finish. It is comprised of 2 pieces, a top hutch with glass doors and adjustable shelves, and a lower cabinet with doors, an adjustable shelf, and 1 dovetailed drawer . Dimensions: Top half 32″W x 14.5″D x 32″H. Bottom half 33.5″W x 16.5″D 32.5″H. Total height: 64.5″. 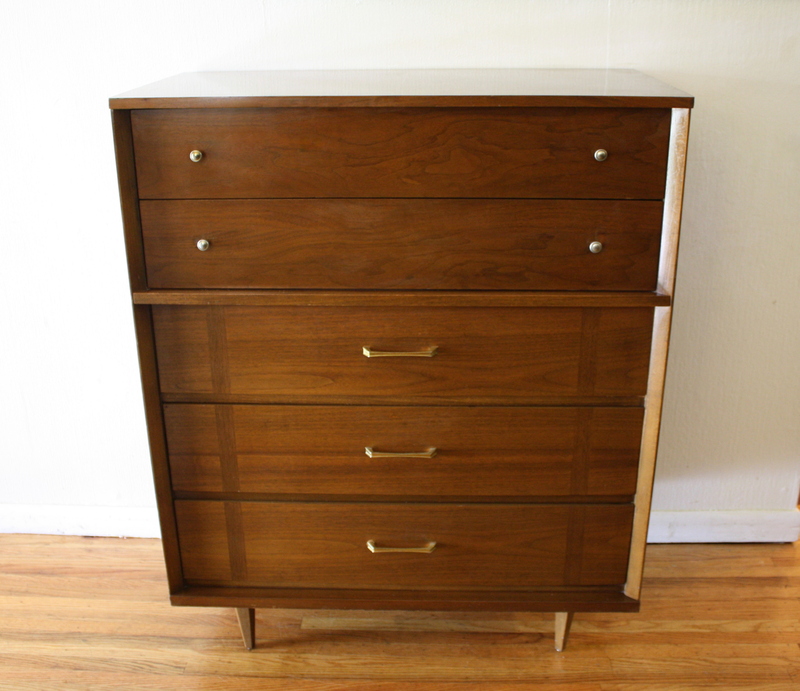 This is a matching set of mid century modern dressers and side end tables. 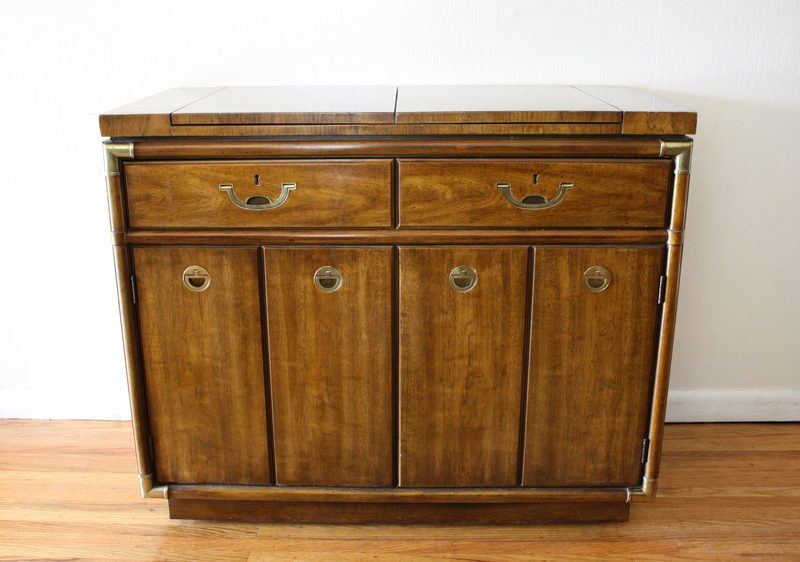 The tall dresser has a parquet design, 5 dovetailed drawers with brass handles and knobs: 36″W x 18″D x 44″H. 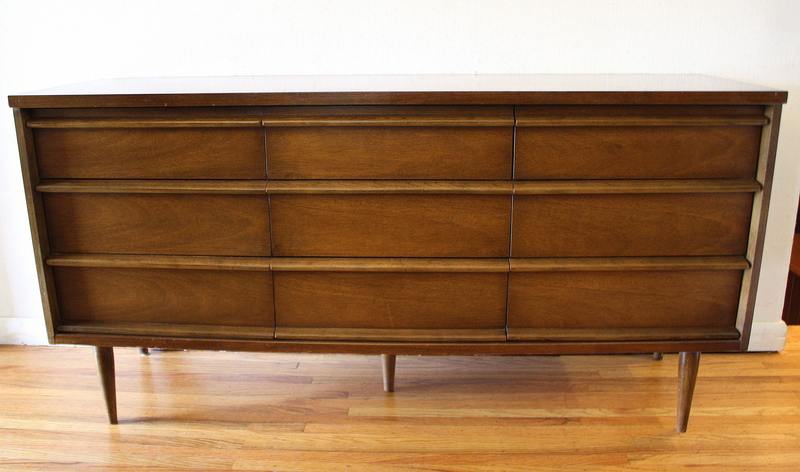 The low dresser credenza has the same parquet design, 6 dovetailed drawers, and brass handles: 50″W x 18″D x 31″H . The side end table nightstands have 1 dovetailed drawer each, and an open shelf: 18.5″W x 15″D x 25″H. 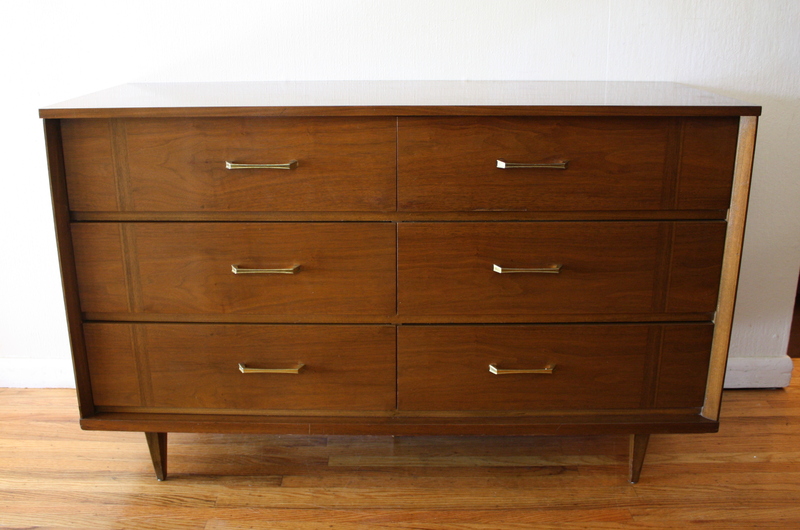 This is a mid century modern mini credenza by Harmony House perfect for smaller spaces. It has 3 dovetailed drawers and a side cabinet with a removable pull out tray. The top has a great concave notch cut out design. Dimensions: 50″W x 18″D x 26.5″H. 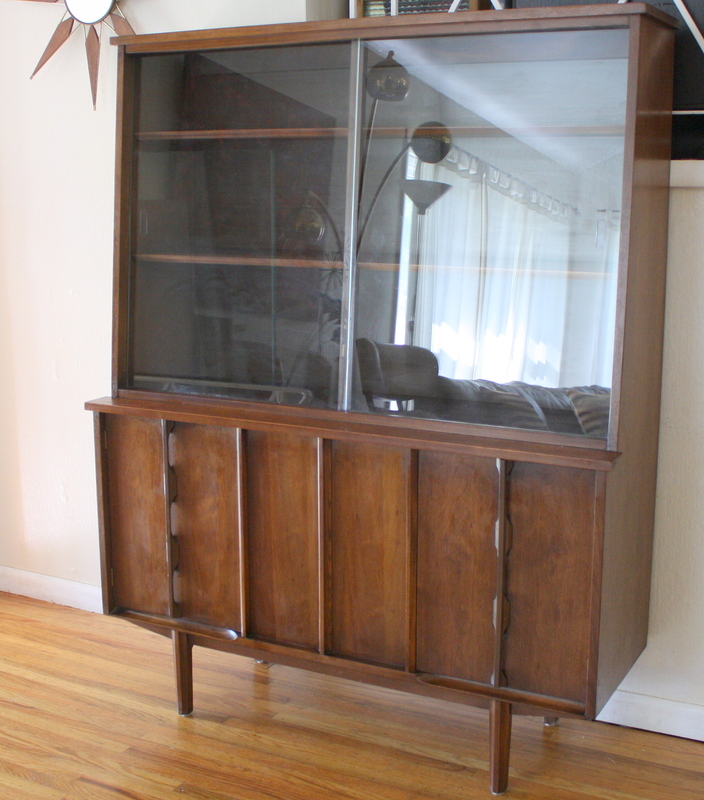 This is a mid century modern campaign style console bar cabinet from the Drexel Accolade collection. It has 2 extension leaves that flip open, 2 dovetailed drawers, 2 lower cabinets, and is on wheels. Perfect for serving and storage. Dimensions: 40″W x 19″D x 33″H, 60″W leaves unfolded. This is a mid century modern folding table by Lane. It has 2 folding leaves, a black formica top, 1 dovetailed drawer and bottom shelf. Perfect for a bar, serving cart, sofa table or extra storage. Dimensions: 38″W, each folding leaf adds 17″, 15″D 29″H. This is a mid century modern console bar. Great to mount your flat screen or use as a bar. It is solid wood, with beautiful curved edges. It has a hidden drawer and a bottom compartment with doors that swing open. Dimensions: 34″W 18″D x 32″H. Here is a selection of mid century modern vintage glasses and barware. Check captions for availability. This is a selection of antique advertising bar mirrors for Heineken, Drambuie Liqueur & Miller High Life beer. They have great patina and are framed in solid wood.